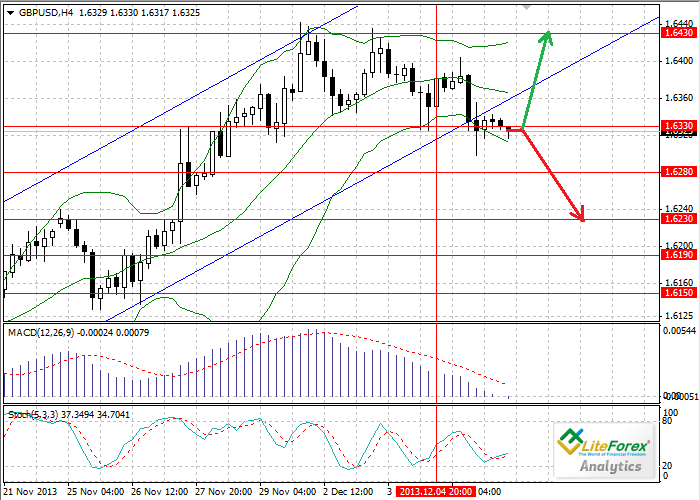 At the moment the pair is trading at the level of 1.6330. It is not expected that it will go below the level 1.6300 in the near future. Investors will not take risk before the news from American labour market will become known. However, if the number of new jobs outside agricultural sector rises again, quotes can fall to the levels of 1.6280 and 1.6230 or even up to 1.6290. On the four-hour chart technical indicators give mixed signals. Bollinger bands are directed downward; bottom line of the indicator provides support to the price chart. MACD histogram has moved to the negative zone, forming a sell signal. Stochastic lines, on the contrary, are rising.